Attention New York-area dada fans! 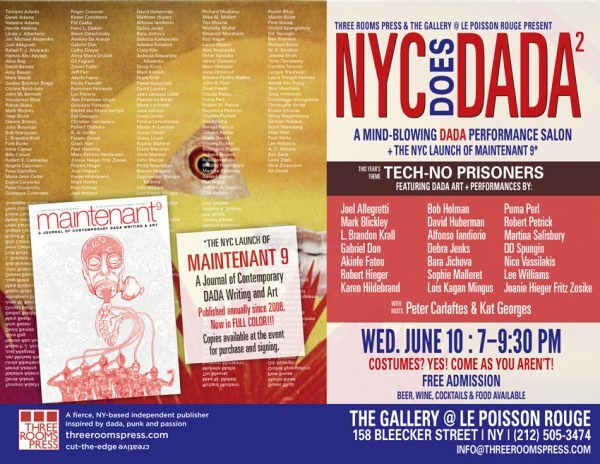 Three Rooms Press is hosting not one, but two dada events in June, to celebrate the launch of the ninth edition of MAINTENANT: A JOURNAL OF CONTEMPORARY DADA WRITING AND ART. 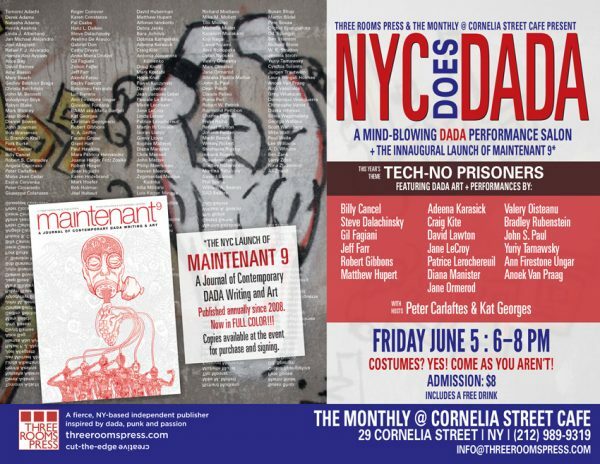 First up is the eighth annual Dada salon at Cornelia Street Cafe (29 Cornelia Street, between Bleecker & West 4th Street). The salon, hosted by Peter Carlaftes and Kat Georges will feature disruptive and thrilling readings & performances by Yurly Tarnawsky, Valery Oisteanu, Steve Dalachinsky, Billy Cancel, Jane Ormerod, Ann Firestone Ungar, David Lawton, Craig Kite, Anoek Van Praag, Bradley Rubenstein, Jane LeCroy, Jeff Farr, Adeena Karasick, Diana Manister, Gil Fagiani, Robert Gibbons, Matthew Hupert, John S. Paul, & Dada provocateur Patrice Lerochereuil. Admission is $8 and includes a free drink. The second Dada salon will pop up in The Gallery at Le Poisson Rouge (158 Bleecker Street at Thompson). Hosts Peter Carlaftes and Kat Georges will feature illustrious performances and smashing readings by Puma Perl, Ann Firestone Ungar, Joel Allegretti, Gabriel Don, Nico Vassilakis, Yuriy Tarnawsky, Mark Blickley, Robert Hieger, Joanie Hieger Fritz Zosike, Bara Jichova, David Huberman, dd spungin, Lois Kagan Mingus, Alfonso Iandorio, Akinfe Fatou, Lee Williams, Debra Jenks, Sophie Malleret, Bob Holman, Robert Petrick, L Brandon Krall & Martina Salisbury. Quite a Line Up for Quite a Night!!! Admission is FREE! As part of this year’s Dada celebrations, Three Rooms Press is auctioning off two original artworks by two famed 20th century French collagists, Mary Beach and Claude Pelieu, via silent auction. Bids can be made at the events, as well as online. Details to come. For both events: Costumes encouraged! Our theme this year is TECH-NO PRISONERS. The only guideline you need to know for your costume is COME AS YOU AREN’T! For more information about either event, email info@threeroomspress.com.